Does your facility have storage space or a warehouse? Do you utilize forklifts? Do your personnel and your forklifts share the same space throughout the day? Chances are, the answer is yes. And although forklifts can make tasks easier and more time efficient, they can also cause serious injury. One morning a crew was unloading material from the loading dock to the warehouse. To more efficiently move the material, the crew used a forklift to move the heaviest boxes. At first, the forklift helped to move the process along quickly. While the forklift operator was speedily moving material back and forth from the dock to the warehouse shelves, employees were also busily carrying crates in the same area. An employee loaded a crate into its dedicated storage space in the warehouse and started walking back to the loading doc. He also took out his cell phone and decided to take a quick call on his way back. Meanwhile, the forklift operator dropped some material off in the warehouse, and rather than turning the forklift forward, he shifted the engine to reverse and backed up into the loading area. Distracted, the employee talking on his cell phone walked into one of the operator’s blind spots. Before anyone could react, the left track of the forklift crushed the employee’s foot. The man was immediately rushed to the hospital and received medical treatment within minutes, but the damage was done, and as a result one of the man’s toes had to be amputated. Many facilities have established warehouses as an extension of the Parts Department. Regulations require anyone operating a forklift to receive training on how to properly and safely operate the machine. This training comes in two forms; first in the classroom, and second in a hands-on training and evaluation session. This first part of the training must cover facility specifics and may require a separate instructor. It is mandatory that before an employee operates a forklift, he or she must receive both the formal training as well as the practical. An operator is found to be unsafely operating a forklift. An accident or near accident takes place. There is a change of equipment. There is a significant change in the workplace. An evaluation indicates the need. Once every three years a complete evaluation must be conducted of each operator’s performance. Recommend limiting the use of cell phones or other electronic devices while traveling through the warehouse as these are a source of pedestrian distraction. Powered Industrial Trucks (PIT) drivers should already be restricted from using these devices while operating equipment. Wear bright, highly visible colors while they are walking in the warehouse or an area where heavy machinery operates. All personnel who are on foot around dangerous equipment should be trained on space awareness and be restricted from the loading dock when trucks are actively loading or unloading materials. Warning signs and other cautionary material should be strategically placed in areas where collision is a high risk. Establish and maintain safety rules around right-of-way and pedestrian-only paths once implemented. An employee lane should be identified, after an evaluation of the traffic flow in the warehouse is conducted. Implement a “Steel Toe Shoe Only” policy for all warehouse employees. Steel toe caps may also be provided for visitors if assessed as necessary. 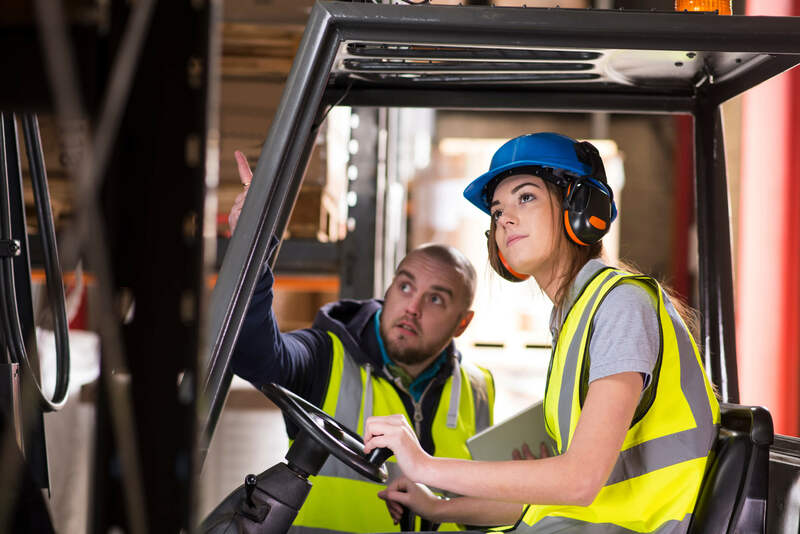 Forklifts are used frequently and it is important to have a system in place that protects employees from potentially losing their career, as well as losing the use of their feet. KPA has prepared a forklift safety online training program that management can use to help satisfy OSHA requirements. Facility specific training may also need to be conducted to supplement the online training if facility specific conditions are not covered. In some cases state regulations may be more stringent than those shown above.